Inevitably, CM Punk was going to let us down. We had all our hopes pinned on him, not as the next great wrestler but as a world-altering event; he wasn’t so much our Messiah as our Rapture. And like so many cultists foretelling the end of days, we wake up the next morning only to find that everything is exactly the way it was yesterday. No holy fire from the sky. No bright new era of professional wrestling. The real question, however, isn’t what happened to the reckoning, but how much did Punk ever really want a new era? As he emerged as the WWE’s top star over the past six months, Punk’s character seemed in conflict with himself. He was a progressive figure — an agent of change, as he’ll frequently say — but remained fixated on the past. He billed himself (functionally, if not explicitly) as wrestling’s savior, the man who would rescue WWE from its monotonous, outmoded ways. Yet he spends more time rhapsodizing about the wonders of WWF ice cream bars than plotting an inspired path for the future. On one hand, Punk deserves credit for combining these two divergent strains; on the other, his historical references and wrestling in-jokes might be seen as simple pandering to fans in their 20s and 30s. These children of the 1980s are Punk’s bread and butter. They’re savvy to wrestling’s backstage machinations and they’re old enough (or spend enough time on YouTube) to lovingly remember pro wrestling’s days of yore. Thus, the cheers for Punk’s recent appropriation of “Macho Man” Randy Savage’s signature elbow drop.1 Punk’s character provides a logical selling point: He’s a wrestling fan who just happens to be a wrestler. He’s one of us. Even Punk’s most forward-looking routines aren’t entirely new; the worked-shoot style that he’s brought into vogue was perfected in ECW’s heyday, and many of his antics are revisions of his pre-WWE, Ring of Honor shtick. He fetishizes wrestling’s glory days, just like us. His beef is with the present, with the tedious, aimless, and audience-insulting TV-PG format. Those are legitimate gripes, but it’s becoming clear that Punk doesn’t aim to overthrow the system so much as carve out a contrarian niche within it. He has failed to define his radical goals — other than his own ascension and those ice cream bars — and it’s worth wondering whether he wants to move wrestling forward or is content with remembering the past. The WWE chose to hand out its Slammy Awards on Monday’s episode of Raw, with Punk reigning as WWE champion before the Tables, Ladders, and Chairs pay-per-view event. The Slammys are tongue-in-cheek honors for the year’s top performers and moments, and it seemed fitting that the 2011 edition of the awards took a page from Punk’s own book. Rather than celebrating the past year, they relished a history long past and dove into a sea of nostalgia. Despite that great moment in sports history, fans endured 10 years without Slammys after that. When WWE brought back the awards in 2008, it was part of a broader movement to add more “special event” programs to the calendar, which was, in itself, part of a larger effort to get more people watching. As Variety put it ever so blandly back then: “Bringing back the Slammys is part of a strategy by WWE to air more specials as a way to continue boosting the brand’s profile with audiences.” It’s been an annual event ever since. Right now, you’re probably saying: “Wasn’t this a-hole just complaining about nostalgia right before he launched into a lengthy history of an insignificant wrestling tradition?” So let me state this clearly: Nostalgia is great. Nostalgia is what I built my wrestling-writing career on. 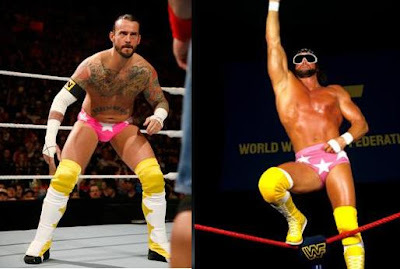 When Punk wore the pink Macho Man tights, I cheered with everybody else. And while WWE has never been shy about reveling in the high points of its history, it’s intriguing that on a night that should have been a celebration of Punk’s ascendance, WWE made a show of rejecting — or rather, of assimilating — Punk’s unique claim on wrestling reminiscence. If the point of the Slammys is to celebrate WWE’s recent history, Monday’s broadcast took the nostalgia a step or five further. The vibe wasn’t so much valedictory as it was retro — the one-off appearances by WWE semi-legends such as Lita, Road Dogg, Mick Foley, Ted DiBiase (Sr.), and Tony Atlas served only to highlight the company’s reliance on characters and storylines that hark back to an earlier era. Triple H versus Kevin Nash, for instance, already happened in 2003, and the return of the masked Kane evoked memories of his character from 1997 to 2002. And it’s impossible to omit the presence — even in his loud absence — of The Rock during Monday’s proceedings. Having been gone from WWE for years, The Rock will headline next year’s WrestleMania in a match against John Cena (which is all good and well, except that his wrestling heyday was 10 years ago). All of this says nothing of Punk — who has a three-way TLC match6 on Sunday against The Miz and Alberto Del Rio — and his odd fixation on a particular, largely forgotten point in wrestling history: Raw general manager John Laurinaitis’ (admittedly embarrassing) in-ring career. You see, prior to becoming a despised WWE backstage player, Laurinaitis was in a laughable NWA tag team called the Dynamic Dudes, who were sort of skaters-slash-surfers-slash-well-uh-dudes.7 To pillory Laurinaitis, Punk’s chief antagonist of late, Punk presented a video to Johnny Ace (set, breathtakingly, to the tune of Stan Bush’s “The Touch”). It was an odd intersection of Punk’s hipster nostalgia and WWE’s penchant for self-tribute. When Punk, just weeks before, slyly saluted Eddie Guerrero on the anniversary of his death by mimicking a routine in which Guerrero faked getting hit by a chair to get his opponent disqualified, the crowd cheered (and, perhaps more significant, wrestling fans on message boards and Twitter simultaneously orgasmed). But when Punk trotted out a mannequin dressed up as a Dynamic Dude to roast Laurinaitis, it wasn’t a sly wink to the well-versed wrestling fan — it was just another ghost of wrestling past on a night full of them. Even when it’s not living in the past, WWE seems like it’s trying to escape the present. Maybe WWE and Punk have found common cause on this point. At the risk of addressing wrestling logic too evenhandedly (or, well, realistically), it’s a bit odd that they held their year-end awards show nearly three weeks before the end of the year, and a week before the year’s last pay-per-view. They had a special holiday episode of Smackdown, complete with Santa Claus, in November. This year has indisputably been the year of the Punk revolution. And WWE, it seems, just wants to get 2011 over with. It shouldn’t be surprising that a star of Punk’s magnitude would be co-opted into the mainstream. When Punk began his campaign for change and recognition, he said he wanted to be front and center on the WWE promotional materials. He meant that figuratively, one would assume. What he really wanted was for guys like him to be given a chance. But if Punk remains content to be a contrarian more than a true radical, then his demands are so much more easily solved by reading that sort of metaphor literally. Check out the poster for Sunday’s TLC event. He’s right there, next to the ice cream bar. Punk is front and center, but other than him, guys like him aren’t getting a chance. For the purpose of marketing, WWE is game to milk every last drop of nostalgia from Punk’s character. Let’s just hope there’s a CM Punk left when they’re done with him. He also modified his ring apparel in tribute to Savage’s early signature look after his death. See: “The World” (a now-defunct Times Square restaurant, WWE’s version of Planet Hollywood) or WWE films or the XFL. Presented, har-har, by the Academy of Wrestling Arts and Sciences. The PPV is officially, redundantly titled TLC: Tables, Ladders & Chairs, and the main event is a match that allows the usage of those three objects; other matches on the card allow either the use of just one such item or none at all. His character name then, and in his later years in Japan, was Johnny Ace, which, probably due to the awkwardness of his surname, is what wrestling insiders still frequently call him. And if you’re of the Brandon Stroud persuasion that Punk is presently playing Triple H’s Attitude Era character, the parallel between that package and Trips’ airing of Vince’s ignominious “Stand Back” video is difficult to ignore.